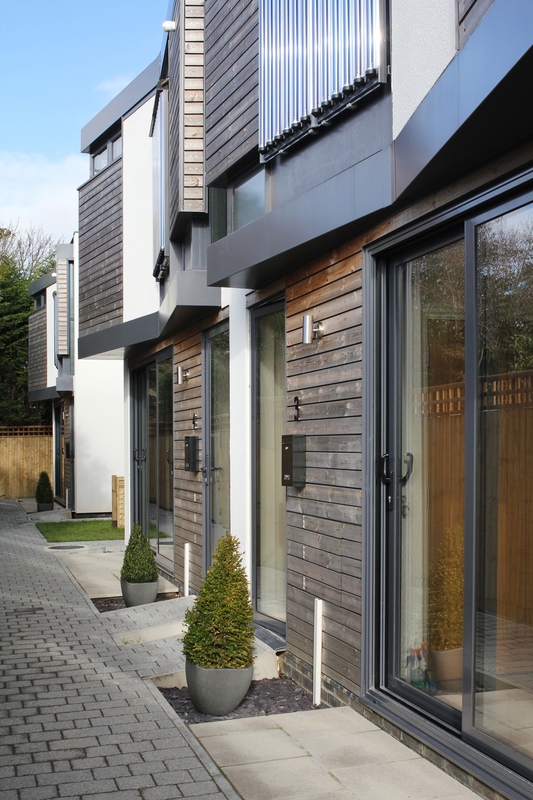 Touted as Eastbourne’s first eco-development, Chandler’s Mews was the destination of a recent trip along the coast with architects Liam Russell and Scott Currie from Shoreham-based practice Liam Russell Architects. Chandler’s Mews is a brand new hidden street of five houses which consists of one detached home and two pairs of semis. It was named after Chandlers Building Supplies, the firm that provided the materials for the project. The site was a row of abandoned garages until it was sold by property giant Grainger plc to father-and-son-team Peter and Gary Winslow. I visited in September just as Gary was putting on the final touches. He was busy but still able to poke fun at trendy architects (which Liam happily reciprocated about stuck-in-their-ways developers). The development is very much a product of its location. The tight spot in which the houses were built, nestled in the middle of a block, surrounded by back gardens. These houses have no back gardens though, and their front doors are accessed via a shared path (a ‘twitten’ as we might say in Brighton). Overlooking issues have been solved rather imaginatively. The upstairs windows on the front are either above head height or side-facing. There are no rear windows as such, but there are skylights. Each of the houses has two storeys and three bedrooms. Their most noticeable feature is their bright white curved side profiles, which contrast against the flowing living sedum roofs. There are many other eco features including timber frames and solar thermal panels. The very recyclable aluminium cladding was something of an experiment but it worked out well aesthetically. 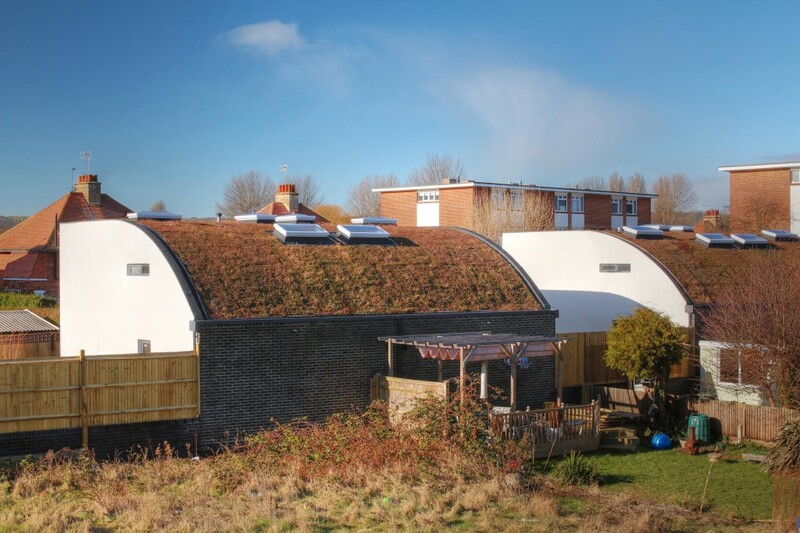 Most of Brighton & Hove’s best eco buildings are individual houses such as 1A Whichelo Place, 15 Lloyd Close, Yew Tree House and the Smart House. One Brighton consists of many units but they are flats. It is good to see an eco-friendly development of several houses. I would certainly be keen to see more multi-dwelling housing schemes built locally with the environment in mind. Gary said that the building process was a “learning curve for everybody”. This is quite appropriate given the shape of the houses. Liam Russell Architects’ next project is a proposal for a striking new house on Albany Villas in Hove. Its white render, unorthodox windows and clever use of space remind me lots of Chandler’s Mews. I will be writing about it in more detail shortly.